If you have somehow never cooked and yet want to, there’s always that troublesome problem of where to begin. Fortunately, The Cook’s Book, edited by Jill Norman and published by those masters of how-to books, Dorling Kindersley, has answered that question in over 600 glorious pages. With The Cook’s Book you can pick your point of entry and launch yourself into the world of food with no fear. You could order take-out for everything but dessert, for example, and start there. And whose holding your hand? Well, Pierre Hermé, one of the great pastry chefs in the world. Or how about if you build a dinner party around a fish course and order in everything else? Charlie Trotter will see you through to an excellent end. 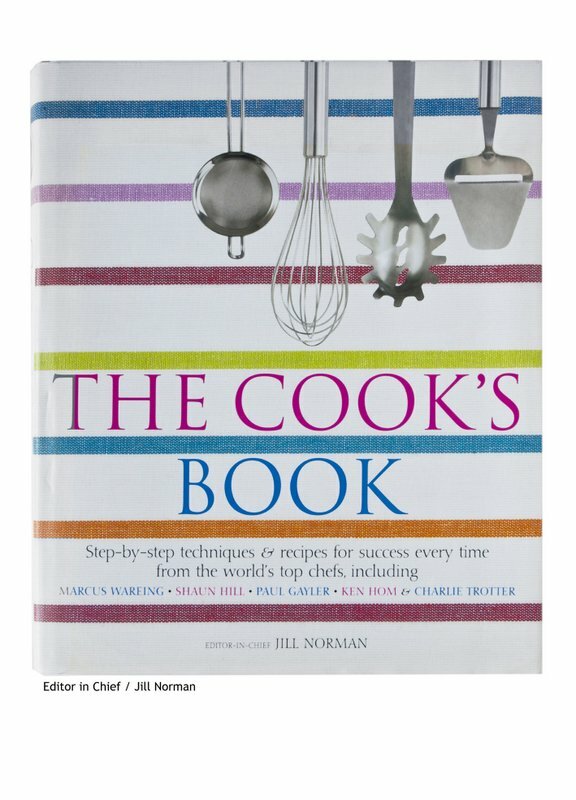 There are fully 18 internationally renown chefs represented between the covers of The Cook’s Book. These are not the sort of folks who generally give introductory courses, and yet that’s what this tome delivers in depth. Trotter’s chapter on fish, the way it is lavishly illustrated and carefully explained, is a publishable masterpiece on its own. But it’s only one chapter among 24 that guides the new cook through basic prep and cooking technique with side trips into a variety of international cuisines. Everything is explained editorially and visually in this brilliantly designed production. One glance at the photo of creamy risotto and you�? ?ll know if your risotto is creamy or not. This isn’t to say seasoned cooks won’t find themselves slavishly turning these gorgeous pages and licking their chops as well. But what’s wonderfully important about The Cook’s Book is that it is the answer for any neophyte wondering where to begin. This superlative volume is a culinary arts education in itself: what foodie wouldn’t want to read Charlie Trotter’s tips on preparing fish and shellfish, or Norman Van Aken’s take on Latin American cooking? Instructions from world renowned chefs like Paris’s Pierre Hermé and Japan’s Hisayuki Takeuchi ring with authority, though female chefs are notably absent, save for Sydney’s Christine Manfield. This book takes a two-tiered approach by expanding on the basics in chapters on sauces and dressings, flavorings, and poultry and game birds, and exploring specific cuisines in sections on India, Japan, the Middle East and other regions. The book may be best suited to professional chefs; amateurs might not be ready to tackle Ferran Adrià’s Potato Foam: 21st Century Tortilla, or Shaun Hill’s Roast Woodcock, in which the head is left on, « since the brains are a delicacy… eaten in much the same way as a lollipop. » Technically, this is more than just a cookbook, but the recipes (with luscious photos) for dishes like Paul Gayler’s Venison with Cherries, Cinnamon & Walnuts; Peter Gordon’s Vanilla & Duck Broth with Rice Noodles; and Dan Lepard’s Flatbread with Pumpkin, Green Olives & Shallots are worth the price of the book alone.